The Business Idea Competition is open to IC students in any major and provides an opportunity for them to learn how to brainstorm, pitch ideas, and connect with alumni and community members. Business Plan Competition Students in any program at IC can present their business plan to a panel of experienced business professionals. Last year the first-place prize was $20,000, second place was $10,000, and third was $5,000. Tim Reynolds '12, D.P.T. '14 was playing high school baseball when he developed shoulder pain. The weeks of physical therapy he underwent after his injury would not only make him pain-free but also spark his interest in a future career. A Leadership Scholarship recipient, Reynolds took full advantage of the opportunities IC offers. He played baseball, joined the Physical Therapy Association, and participated in Colleges against Cancer. As a sophomore, he started the IC chapter of Up till Dawn, an organization that raises funds and awareness for St.Jude Children’s Research Hospital. After receiving his bachelor’s degree in clinical health studies in 2012, Reynolds entered Ithaca College’s two-year doctoral program in physical therapy. He expected to continue with IC’s high-quality educational experience. What he didn’t expect was a business opportunity and help toward becoming an entrepreneur.But when Reynolds thought of a way to turn a dumbbell into a kettlebell, that’s exactly what he got. Reynolds’s design, developed with the help of a classmate and two faculty members, consists of a clasp with a handle shaped like a subway strap. 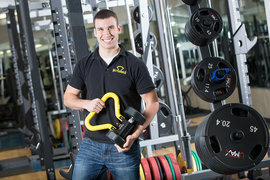 The device can be fitted around a dumbbell bar of any weight to transform it into a kettlebell. After naming the device KettleShell, Reynolds turned to IC’s School of Business to help him learn how to market it. Reynolds first entered his idea in the school’s Business Idea Competition— funded by Chris Burch ’76, cofounder of Tory Burch and CEO of Burch Creative Capital—and won $5,000 to pursue the idea. Then he took classes on developing business plans and pitched KettleShell at the New York State Business Plan Competition, which attracted over 400 entries. KettleShell took third place in the products and services category and $1,500 in prize money. 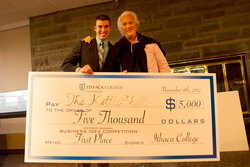 The following year, Reynolds went on to win the $20,000 grand prize in Ithaca College’s Business Plan Competition. The competition gives students the opportunity to pitch their startup plans to a panel of industry professionals who then award money to the most promising ideas. KettleShells are now available for purchase online, and Reynolds is hard at work developing improvements to the product. After graduating in August, Reynolds accepted a job at Millbrook Physical Therapy, the same practice that helped him through his high school baseball injury. He’ll be working as a full-time physical therapist, evaluating patients with orthopedic injuries, developing rehabilitation protocols for them, and facilitating their return to functional activities. “All of my experiences within the past year have been truly amazing, and I am excited to see where the KettleShell will go in the near future,” Reynolds says. “I am also excited to see the continued entrepreneurial spirit at Ithaca College and look forward to mentoring other students from Ithaca College to help them bring their ideas to life."